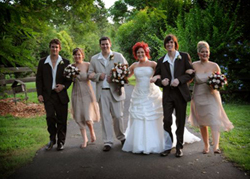 Bundaleer Rainforest Gardens - Wedding Receptions Brisbane is an award winning venue with a difference…specialising in relaxed wedding ceremonies and traditional, modern or themed receptions. Is an award winning venue with a difference. 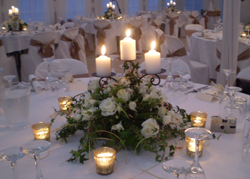 In 2003 and 2004 we were finalists in the Australian Bridal Industry Awards in reception, ceremony venues and function co-ordinator categories. Bundaleer was a finalist in the Business Achiever Awards Hospitality and Tourism - Innovation category. In 1998/99 we were judged Winner in the South-West News Business Achievers Awards Tourism & Hospitality Section as judged by Brisbane Tourism. In 1999 we were Highly Commended in the Micro Business Awards held at Parliament House in Brisbane. Bundaleer is located just 8 minutes from Indooroopilly and 20 minutes from Brisbane. Your guests will enjoy the natural beauty of Brookfield's tiny country lanes. Bundaleer is set amongst tall trees in a magical rainforest area tucked away in the green rolling hills of Brookfield ..a minute's drive from the famous Brookfield Showgrounds and close to historic churches. The serenity of this wonderfully natural environment, the genuine personalised service and superb food ensure a very special and memorable experience. Ceremonies can be held on site in our natural "bush chapel" next to a flowing stream and baby waterfall……Or try our "green cathedral" complete with Billabong & remnants of an ancient rainforest as a backdrop. Or try our " tree grove" under the majestic trees. 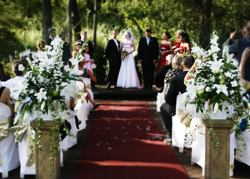 At Bundaleer Rainforest Gardens every ceremony is different…. You might choose to arrive in a charming horse & carriage, a sprawling green Rolls Royce, an Alpha Romeo sports car, Uncle Jack's Dodge or a Bentley to die for……pause and have your arrival photos taken in the shade of a natural bush setting…..then proceed down our green aisle …..to join up with the red carpet lined with rose stepping stones …. continue on down to meet the groom with our wedding arch in the background. Or choose to get married on our natural timber dais built over the creek and hear the baby waterfall spilling over in the background. Dare to be different with one of our unique settings. Photo opportunities abound with the many settings nature has etched through the years. The Gumnut Deck …adjacent to the fairy-lit garden is ideal for relaxed weddings….. looks great decorated with Native Flowers, colourful gerberas or romantic roses. We are happy for you to use our special expertise in creating a theme or "look" for your wedding … or feel free to have talented family & friends help decorate for you. 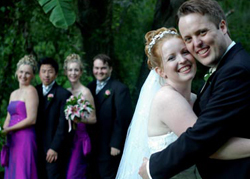 No two receptions are ever the same at Bundaleer Rainforest Gardens. Dare to be different …at Bundaleer Rainforest Gardens. Brisbane's Slice of Paradise.